Moments after their introduction, Michael confided in a friend that he had just met the woman he was going to marry. Jenn and Michael first encountered each other at a wedding—the perfect place to spark the beginning of a new love story. During the six years following this fateful day, they built a full life together—purchasing a fixer-upper, transforming it into a beautiful home, and welcoming several dogs into their family. One afternoon, when Jenn was arriving home from work, Michael sat waiting to pop the question—with a musician playing their favorite song, a chef cooking her favorite meal, and a journey of rose petals. Before they were engaged, the two envisioned an elaborate destination wedding in Cabo. But as planning got underway, the stress of the process overshadowed the intimate ceremony they longed to experience. So they contacted Simply Eloped in NYC and decided to combine their upcoming trip to the Big Apple with an unforgettable adventure of a wedding. 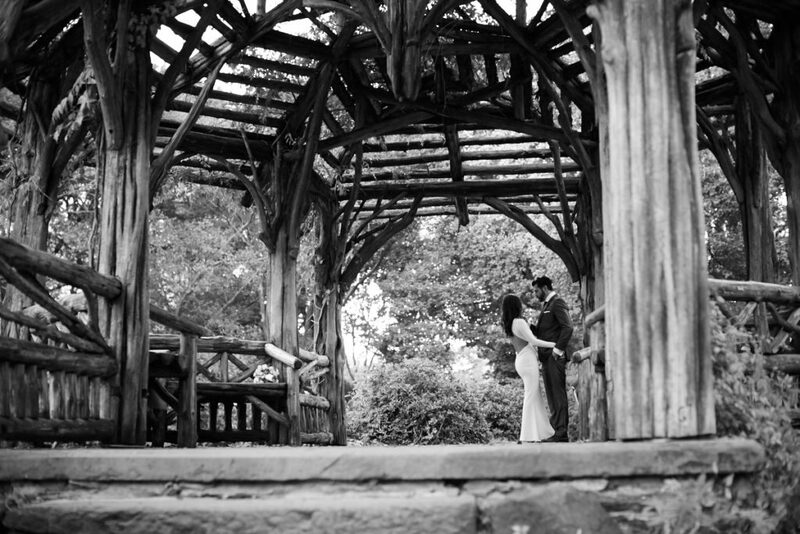 They envisioned exchanging vows tucked in the verdant sanctuary of Central Park, inspiring Janessa from Simply Eloped to recommend The Treehouse of Dreaming for their ceremony. Soon enough, the swift arrangements fell into place. 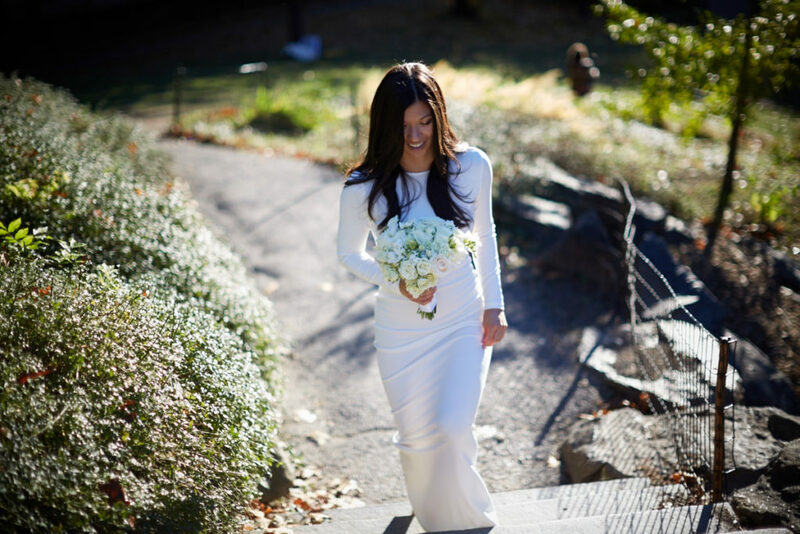 Their big day developed into nothing short of an iconic NYC celebration—incorporating the city’s beautiful fall foliage, the excitement of the NYC marathon, and one of the area’s most well-known romantic restaurants. But one of the biggest adventures occurred before Jenn even made it to the wedding. As she approached her awaiting groom—wedding dress and all—her cab became trapped in a bumper-to-bumper traffic. So in movie-like fashion, she leapt out of the car and hustled across the city to Central Park. As she ran, New Yorkers and tourists cheered her on, yelling congratulations as she wove through the crowds. But since Central Park is quite the expansive labyrinth, she jumped back into a cab, making it to her awaiting fiancé in time. The site of him waiting on the hill of the park—violinist and officiant standing by—is an image she’ll never forget. 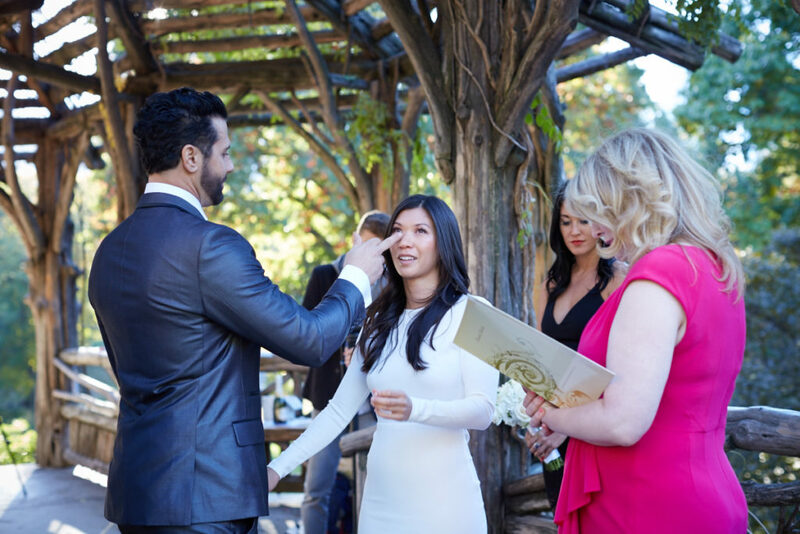 At last, surrounded by the stunning autumn sights of NYC in the fall, Michael and Jenn said their “I Do’s” beneath the vines of the rustic treehouse, serenaded by the music of a New York violinist. A nearby trumpet player added music to the park’s afternoon, and welcomed Jenn and Michael to dance an impromptu first dance to his melody. As their Central Park wedding came to an end, the two journeyed through the park by horse and carriage. The NYC Marathon—which conveniently occurred on the day of the wedding—provided evening fireworks over the river. They rounded out their evening with a romantic dinner and wedding cake at Tavern on the Green. After this breathtaking experience, the couple raves about the growing and ever-changing tradition of elopement. Jenn and Michael were fully open about their choice, nothing was kept from family or friends, and they received endless support. And so, both for couples planning a small elopement or an elaborate blowout, they both advise fully focusing on the reason you’re marrying—to celebrate your beautiful love. Any type or size of celebration can accomplish this task; what matters in the end, is designing a day unique to your relationship and focused on your joy. We wish the couple nothing but the best in happiness and in building a life together! 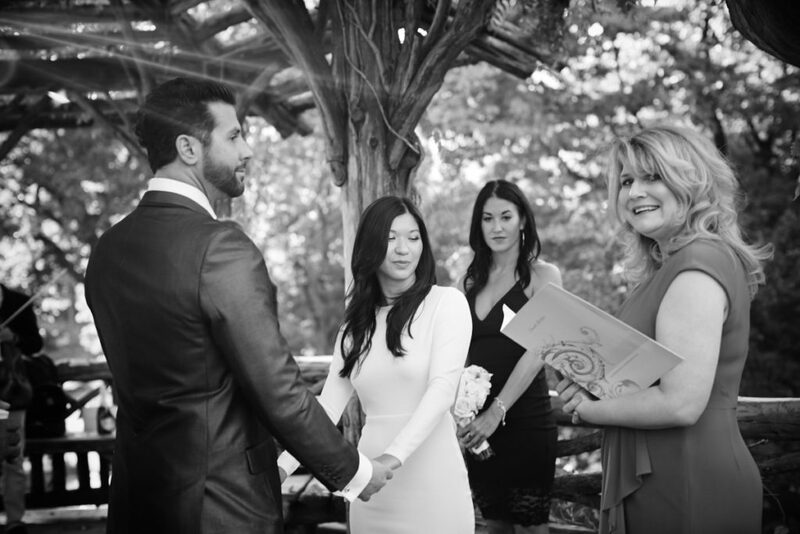 All photo credit goes to Gianna Leo Falcon of Simply Eloped.